Most of the time, we hear about exciting paddling opportunities after they're publicized. We aren't involved in the nitty gritty of organizing them; we're content to participate. Not so the upcoming Burnham to Marquette Sea Kayak Expedition. We've been privileged to help plan this event, sponsored by the Northwest Indiana Paddling Association and spearheaded by its president, Dan Plath. There are a lot of pieces to this puzzle, and Dan has managed to bring together a huge consortium of organizations in support of it. 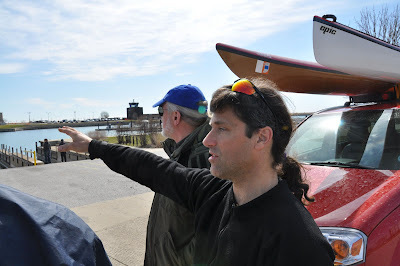 He's also reached out to paddlers in Indiana and Illinois to map out the route and strategize about how to enable a group to safely paddle it. One of the challenges is finding appropriate put-ins and take-outs along a 50-mile stretch of Lake Michigan's shoreline. 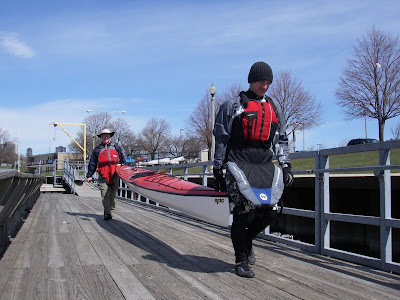 Yesterday, Dan and his fellow Hoosier, Steve Barker, met us, Lyn Stone (of CASKA) , Gary Mechanic (also of CASKA and the Illinois Paddling Council) and Keith Wikle of the West Michigan Coastal Kayakers Association, to explore possible put-ins. 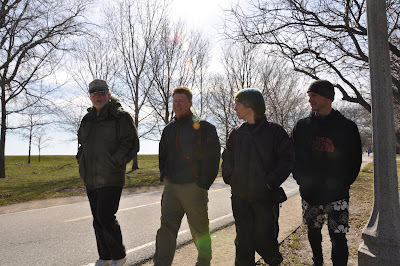 Gary Mechanic, Dan Plath, Sharon Bloyd-Peshkin and Steve Barker, pondering the long carry at 31st Street. We began at 31st Street, a beautiful beach with two major drawbacks: a long carry and limestone blocks offshore to break incoming waves. It isn't the ideal spot for a large group of paddlers to launch, particularly if some of them aren't experienced. Next we moved to Burnham Harbor. The marina on the west side of the harbor has launch ramps that would be perfect for our purposes, provided we can obtain access to them and the nearby parking. Of the two sites, this was our preference. Alec Bloyd-Peshkin points out the easy access at the Burnham Harbor Marina. All this scouting worked up our appetite for paddling, so we unloaded our boats and got on the water. Dan Plath and Steve Barker carry a boat down to the water. It was a beautiful day. Keith dove right in. Never mind the 40-degree water. Keith Wikle jumped in and scrambled into his boat. Lyn documented the event. We paddled out the harbor and into what had been predicted to be 2- to 4-foot waves but turned out to be 1- to 2-footers at most. Still, we were aware of the added risk of the cold water and kept a watchful eye on each other. Stay tuned for updates on this event. The weather and the water will be warmer. Not only will this be an opportunity to enjoy a long paddle in good company; it should also be a chance to learn about and advocate for a blueway and greenway from the tip of Chicago to the east side of Indiana. 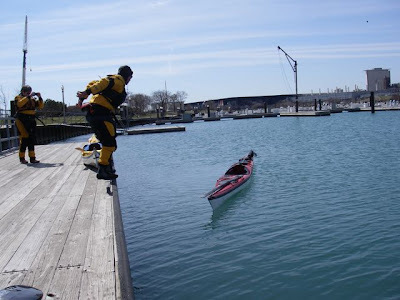 And who knows--perhaps it will be the start of a water trail clear around Lake Michigan.